We were in Cambridge in September 2004 when the Titan arum at the Cambridge University's Botanical Garden bloomed for the first time in 20 years. 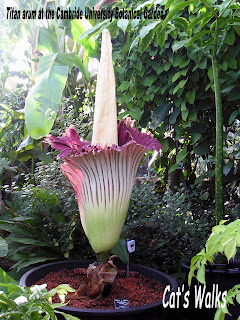 A native of Sumatra, this giant flower (largest flower stalk in the world) is famous for it's odor--- the smell of rotten flesh. This odor is used by the plant to attract pollinators like beetles and flies. We were really lucky because the bloom lasts for only 2-3 days. This event is so rare that you can even find in wikipedia a list of all known publicised Titan arum blooms in cultivation!